The Cone. Cone of Shame. E-collar. Whatever you call it, your dog is bound to have to wear one at least once in their lifetime due to spay or neuter, an injury, or skin condition. Elizabethan collars (e-collars) help your pup heal by stopping them from licking, scratching, or rubbing the affected spot. 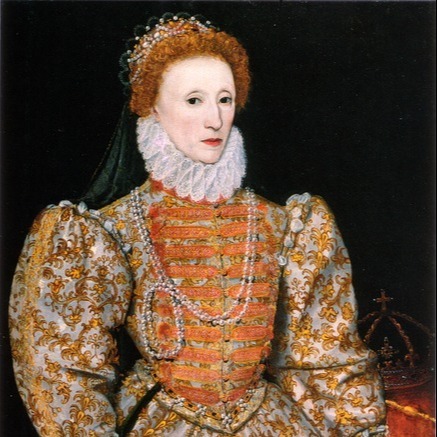 Elizabethan collars were named because of their likeness to ruffs popularized by Queen Elizabeth I in the Tudor period. While your pup doesn’t look as stylish as the Queen, it does protect them from licking, scratching, or biting areas they shouldn’t, promoting faster healing times. 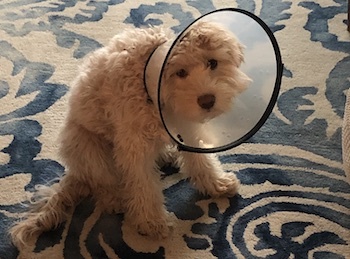 My puppy Mary Berry, a mini Goldendoodle, celebrated National Spay Day by getting spayed! With a bunch of extra hugs and some tears (mine more than hers), I left her in the capable hands of our veterinarian. I picked her up about 6 hours later — loopy, sleepy, and wearing a cone. She was very excited to see us, and her cone was flopping around every which way.Mary Berry took to her cone in her typical easygoing fashion — in stride! This video was taken on our walk home from the veterinarian. She was a little unsure about spacial awareness, but otherwise, she was a happy (albeit very loopy) dog. We went back and exchanged it for the next size up, but this one seemed too heavy for her to support her head (once again, it could have been the drugs). So, we went back to square one — the plastic cone from the veterinarian. Turns out, the plastic e-collar like this one was the best solution for her. It’s good to know that not every dog will be as accepting of the plastic e-collar, so it’s great there are soft-sided options! While alternatives for e-collars exist, like a t-shirt, baby onesie, or even specific "pet recovery suits," make sure to check with your veterinarian before trying anything different than what they've sent your pet home with. 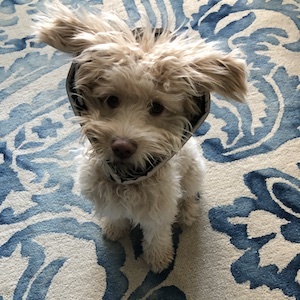 While we were lucky that she took to her collar without issue, many pups don’t take to wearing one in stride and need to be desensitized to an e-collar before they’re comfortable wearing one. If possible, it’s best to introduce them to one before they need it. If your dog has a planned surgery, like a spay or neuter, ask your vet for a cone before their surgery so you can take steps to desensitize them to it before the big day. Some puppy classes will help you introduce things like muzzles or e-collars to your dog, but even if they aren’t exposed to one in class, you can purchase an e-collar on Amazon or at your local pet store and work through desensitization at home. Learn steps you can take to help your dog feel comfortable in their e-collar. Our veterinarian informed us that Mary Berry wear her e-collar for 14 days after her spay so the area was completely healed before she had access to the area again. 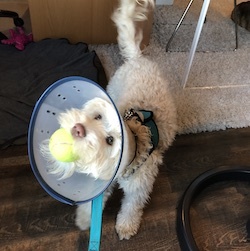 When cones are removed too quickly, and the dog is allowed to lick, scratch, or chew their incision site, wound, or hot spot, it could result in delayed healing, prolonged treatment, or other problems. And in the case of a surgery, like Mary Berry's spay, stitches can be prematurely pulled out, causing an infection or even failure of the incision closure (possibly with organs popping out!). Fourteen days later, Mary Berry was cone free! She’s glad to be free of it, but using it helped her heal completely, which is the most important thing to me. Has your pup had to wear a cone? What did they think of it? Let me know below in the comments.